A 20-year-old Missouri man has been charged in connection with the shooting that occurred outside of the Ferguson Police Department last week which left two officers injured. Authorities said on Sunday that Jeffrey Williams of St. Louis, MO was arrested and charged with five counts related to the Thursday shooting that sidelined a demonstration outside of the Ferguson police station amid seven months of protests prompted by the death of an unarmed teenager at the hands of law enforcement there last August. Williams confessed over the weekend to firing a gun outside the police station, authorities said, but told officials that he wasn’t targeting cops. Rather, according to officials, Williams said he had been in a dispute with other people outside of the building which intensified to the point of violence. An officer with the St. Louis County Police and another from the nearby Webster Groves Police Department were struck in the shoulder and face, respectively, while outside of the Ferguson station early Thursday, just after midnight. St. Louis County Police Chief Jon Belmar said at a press conference several hours later that the protest outside of the building had turned “pretty rowdy” when the cops came under attack. “It’s possible at this point that he was firing shots at someone other than the police, but struck the police officers,” McCulloch said. Williams has been charged with two counts of assault in the first-degree, two counts of armed criminal action and one count of shooting a firearm from a motor vehicle with injury – all felonies. Bond for Williams was set at $300,000, and the New York Times reported Sunday evening that he was still in police custody. Williams was arrested late Saturday, according to the paper, but charges weren’t formally announced until the following day. The protest in Ferguson that started Wednesday evening and ended early the next morning when shots were fired was among the latest in a series of demonstrations held in the St. Louis suburb in the wake of last July’s death of Michael Brown, an unarmed black man fatally killed during an altercation with a local police officer. Protests erupted in the immediate aftermath of the incident in Ferguson and across the United States, and a new wave of rallies erupted in recent days upon the release of a federal investigation into the matter and the subsequent response. A six-month-long Department of Justice probe “revealed a pattern or practice of unlawful conduct within the Ferguson Police Department that violates the First, Fourth and Fourteenth Amendments to the United States Constitution and federal statutory law,” according to the recently-released DoJ report concerning the city’s law enforcement practices. Ferguson’s city manager was fired on the release of the report, and the chief of police said last week that he will resign later this month. The results of a separate DoJ probe, also released this month, revealed that federal authorities concluded that the officer who shot Brown, Darren Wilson, won’t face civil rights charges. 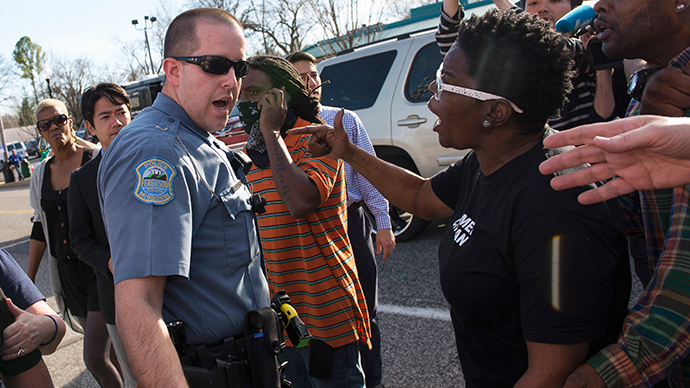 Wilson resigned from the Ferguson Police Department following last year’s events.